Rumors have been swirling for a couple of months about Samsung coming back to Wear OS, but nothing really substantial has been reported up until this point. Ice Universe says in a tweet that the device will be known as the Galaxy Watch, but it is the Samsung Gear S4. The name change makes sense as Samsung has typically reserved the “Galaxy” name for Android devices. The tweet also shared a few specs for the device. It backs up the previous report of the Gear S4 having a 470mAh battery. The tweet also claims the chip will be manufactured with “PLP package,” which should mean a smaller board. Lastly, the watch will “new UX interaction” and blood pressure measurement. The UX mention is interesting as we don’t know of any such features coming to Wear OS. It could be an indication of a rotating bezel, which has been featured on other Gear smartwatches. We have no idea when this device will be officially announced, but the Galaxy Note 9 event could be a contender. 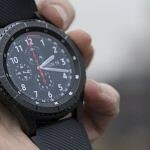 Are you interested in a Samsung Wear OS device or do you prefer Tizen?